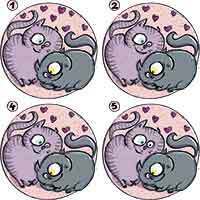 Cuddle up with this fun puzzle and find the matching cats. Out of the six kitty pictures, only two are purrfectly identical. Can you find them? Here’s a handy hint: pay close attention to their mouths.